This is the first in a series of blog posts that examine how different kinds of Medicine are employed in someone's recovery. In future blogs, we will find out how Food, Movement, Art and Practice are also used. So if you recognize any of these from your Recovery Medicine Bag, please contact me and we can talk about sharing your experiences - I'd love to know more about how you do it! We'll kick off this series discussing tattoos. I have chosen this topic because they have been used as a kind of Medicine by societies all over the earth for thousands of years. One way they do this that still holds true to this day, is by providing a clear dividing line. We are "one way before" and "another way after"; we are irrevocably changed. This is also a result from the brand of TAHL (trauma, abuse, heartbreak and loss) that landed in our lives and caused devastating wounds. We are irrevocably changed. Getting a tattoo can bring healing to this. Because by getting ink, we can enter into the process with the awareness, knowledge and clear intention for recovery. We are willing participants in the experience. This time, it's our choice. Big difference; and one that can be very empowering. For this inaugural journey into Tattoos Are Medicine, I will use myself as the example ; ) I hope it proves helpful. What is your tattoo that helps you in recovery? I have a Wolf created in the style of the North West Coast First Nations’ artwork. He has one Wolf paw and one human hand, as well as one Wolf eye open in this world while in its tail, there is a shaman wearing a mask with his one eye open into the spirit world. 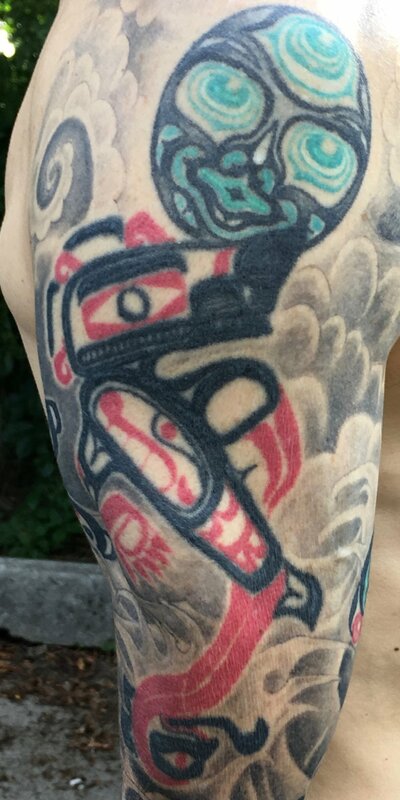 What is it about this tattoo that gives you Medicine? There are a few things. First, Wolf for me is about brotherhood. I’ve lost a lot of dear, close friends to addiction and this tattoo reminds me of my connection with them. This is a daily reminder of how fragile this life is, how quickly everything can change and how deadly addiction can be. This bring me into the present moment and helps me to express how important those still here and around me are. It’s been easier in my life to hold back telling people, especially my brothers, what they mean to me. That I love, respect and honor them, and share that in ways that are authentic and vulnerable. It ain’t always so simple! Another Medicine this tattoo connects me with is my spiritual practice. In this life, it’s so easy to overwork, get distracted or caught up in drama. For me, I need to do things; practical, physical activities that take me out of my day to day busy-mind-thinking and deliver me to a sacred place. I’ve got the tools in my practice to do this but sometimes I need that little push, that reminder, to get me over the hump to follow through. This tattoo helps me do exactly that. And similar to that, one thing my relationship to my brothers always was (and still is) about is “Just do it”. Nothing provides me the support and incentive like knowing I’ve got someone on my side and who always has my back. I miss getting that from those that have passed. This tattoo reminds me that in some ways, I still carry them with me and it’s my responsibility to keep going. When it works, I “Just do it” - and it’s successful every time. Not because I get the results I was hoping for and everything went according to plan but a success because I know I’ve done the next right thing and my connection with my brothers helped make that happen. The basic tattoo was done by Tinker at Yoni Tattoo on Ventura Blvd, in Tarzana, CA in 1998 (which is no longer open). The Moon above the Wolf's head was redone by Damian Bart in 2003 in Ft. Lauderdale, FL. While the Japanese shading and the full sleeve was done by Bart Willis from Southside Tattoo in Austin, TX over a number of sessions in 2014 and '15. Leave a comment below and let me know your thoughts about this blog and the entire series. As Good As It Gets-Part 2: Where's the bang?